I was skeptical that a ring could comfortably fit two sizes of fingers; band is 14 carat gold. It is beautiful, comfortable and quite attractive. I’d buy it again. 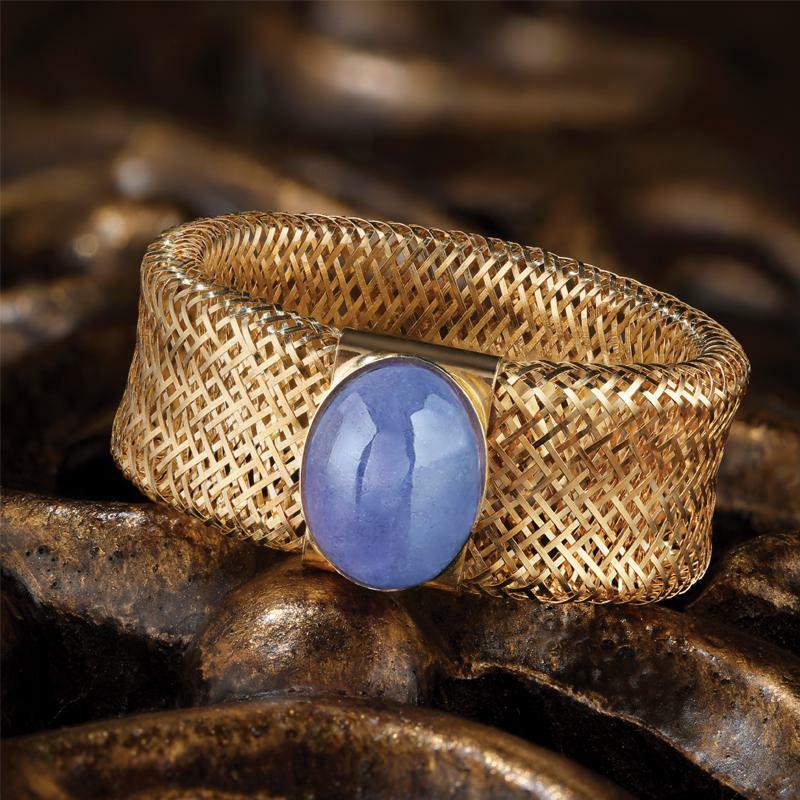 The Via di Oro Tanzanite Ring stretches to fit three ring sizes. The ultimate Italian indulgence...14K gold tanzanite ring made in Italy! Now that's amore! Italian gold artistry has a rich history that stretches back 2,000 years. The Italian hill town of Arezzo is one of the most important manufacturing centers in the world for gold jewelry. It is also arguably the most creative and innovative locale where jewelry is made with the artistry and craftsmanship that are the hallmarks of Italian jewelry design. So, naturally that’s where we went to seek out the best artisans on earth to create our Via di Oro Tanzanite Ring. We found an Arezzo-based company that is redefining not just the look of bold gold jewelry, but the feel. The artisan creates designs using finely woven gold mesh, in threads that in some cases are half the thickness of a silken thread. They have shaped and coaxed precious gold into an intricate ring that has the magical ability to stretch an entire ring size. Then to top it off, they’ve added a perfect oval cut tanzanite. Unlike other gemstones, which are mined all over the world, tanzanite can be found in only one place on Earth: in the remote Merelani Hills in the shadow of Mt. Kilimanjaro in Tanzania, Africa. To possess a solid gold ring with genuine tanzanite handcrafted in Arezzo is an expensive venture. However, at Stauer we’ve made it our mission to make the extraordinary affordable, making the Via di Oro Tanzanite Ring a piece of jewelry you’ll both adore. Now, that’s amore!